Braj Ki Holi is the famous Holi festival held in the Braj area near Vrindavan and Mathura associated with Hindu God Krishna. The Holi here starts from the first day after the Phalguna Amavasya and the festivities or Mahotsav gain momentum from the Ekadashi day, the 11th day during the waxing phase of moon in Phalguna month. Braj is believed to be area in which Lord Krishna played with his friends and Radha and other Gopis and grazed their cattle. The belief is that it is in this area Krishna played Holi with Radha. The Holi songs of Braj area are sung in pure Braj Bhasha (the classical language of the land). Krishna and Radha devotees from all over the world can be seen lost in a trance, forgetful of their dresses, torn or disfigured with splashes of colors, at Braj during the period. Temples and villages associated with Lord Krishna and Radha have separate celebrations. 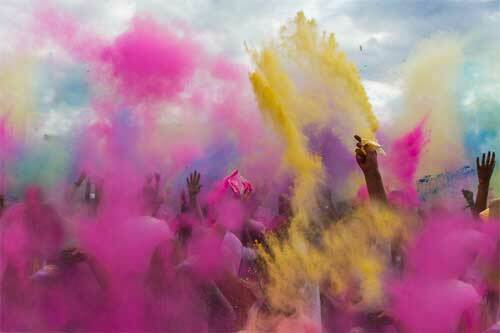 One of the important celebrations during the period is the Lathmar Holi. Another significant celebration is held at the Baldev Town, which is associated with the Lord Balarama, the elder brother of Krishna.